This semester, Liz DiDonna has joined the Department of Art as the new Academic Program Specialist and Art Advisor. DiDonna received her BFA in Studio Art from Wayne State University and her MFA in Studio Art from Florida State University. As a graduate student at FSU, she was awarded the Florence Teaching Award, which allowed her to teach art classes abroad in Florence Italy. She has taught several of our own classes her at FSU – including 2D Foundations, Drawing Foundations, and Beginning Ceramics – and has participated in several lectures and national workshops and conferences. Additionally, she is a member of the College Art Association (CAA), the National Council on Education in Ceramic Arts (NCECA), and the Southeastern college Art Conference. 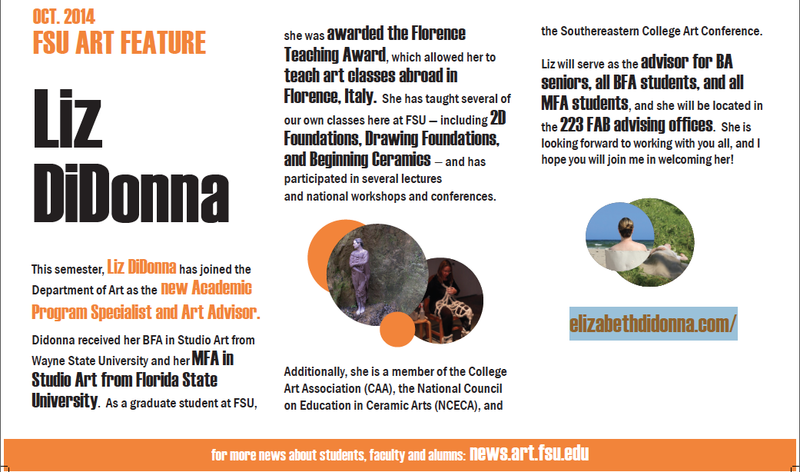 Liz will serve as the advisor for BA seniors, all BFA students, and all MFA students and she will be located in the 223 FAB advising offices. She is looking forward to working with you all, and I hope you will join me in welcoming her!